The UK and Ireland Section been recognised for outstanding membership retention performance in 2018. The award came in the form of a communication from Takako Hashimoto, Chair, IEEE Membership Recruitment and Recovery Committee. I am pleased to recognize the United Kingdom and Ireland Section for meeting its retention goal for the 2018 membership year. Congratulations! The membership development goals were developed based on your Section’s three year performance. 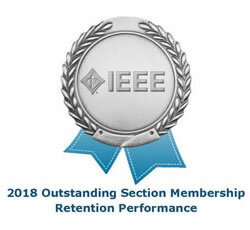 You are to be commended for continuing to grow IEEE membership in the United Kingdom and Ireland Section. In recognition of this achievement, I have attached an image that you can place in your e-mail signature and on your Section website or newsletters, which signifies your outstanding achievement for the 2018 membership year. Please feel free to share this with other leaders in your Section to recognize the good work you are doing, and to let your members know you are working hard to provide them the best member experience possible.